Mary Kay Ash loved Christmas. She often urged us to keep the Christmas spirit of giving and love all year round. Therefore, December is a perfect time to host a selling event that also benefits her legacy, The Mary Kay Foundation℠. Michelle Williams, Independent Future Senior Sales Director of Lexington, Kentucky, did just that. She happened to snag the Santa from ABCs Extreme Makeover: Home Edition for her event, Breakfast with Santa. A local business catered breakfast, and she included a shopping area. 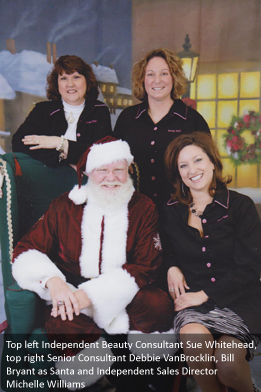 Participants could have breakfast with Santa and get a 4x6 photo for $15. Since the breakfast was donated, most of the profits went to the Mary Kay Foundation℠. If you wanted to take this idea and grow it, you could add a Silent Auction, which allows participants to browse and donate at the same time. You could create holiday gift baskets suitable for men, women, teens, etc. Then, you can have beautiful displays and the opportunity to build awareness at the same time. Remember though, your events don’t have to be big. The small donations are just as important as the large ones. It could be your dollar that finds the cure for cancer. Stacy Graves is Managing Editor of The Mary Kay Foundation blog. You can connect with her by email at stacy.graves@me.com. You can also find her on Facebook at www.facebook.com/stacy.f.graves and Pinterest at http://www.pinterest.com/stacy_f_graves/.